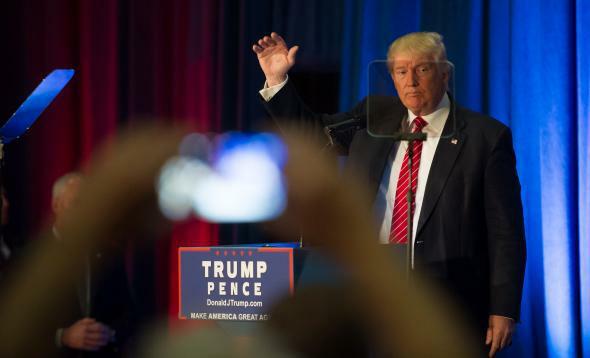 Trump's false claim that San Bernardino neighbors saw "bombs on the floor." Donald Trump looks through a teleprompter as he holds a campaign event at the Kilcawley Center at Youngstown State University on August 15, 2016. Donald Trump on Monday outlined his latest closed-borders approach to national security, which now includes the “extreme vetting” of immigrants with an ideological test of some kind to ensure only “those who support our values” are allowed entry into the United States. He also repeated one of his favorite lies. Trump (and Christie) appeared to be taking liberties with a report from the ABC affiliate in Los Angeles shortly after the attack that was based on second-hand information from a man, Aaron Elswick, who claimed to know one of the shooters’ neighbors. Elswick told the local news station that his unnamed friend told him she noticed the shooters “receiving quite a number of packages and they were also working a lot in their garage.” He then concluded: “And it sounds like she didn’t do anything about it. She didn’t want to do any kind of racial profiling.” A day earlier, a CBS affiliate in Los Angeles quoted an unnamed man who claimed he saw “unusual activity” while working in the same neighborhood but didn’t go to police because, in the reporters’ words, “he didn’t want to be seen as racial profiling,” which was not an outrageous conclusion to come to given the “unusual activity” was, in the interviewee’s words, a half dozen “Middle Eastern guys… kinda dressed nice” on their way to lunch. Trump, though, is more than happy to fudge the facts since it allows him to claim that the San Bernardino attack wouldn’t have happened if the neighbors hadn’t been afraid of the PC police.